Tomorrow the wait is over, the 2014 NBA Draft is finally here. This year’s draft should be full of plenty of surprises. Today, there were already two trades that really surprised many of us. ESPN reported via their twitter that two had occurred: one between the Mavericks and another between Rockets and the Pelicans. If this is any indication of the how this draft will play out, then we should be in for quite the show tomorrow night. Here is my final mock draft for 2014. 1) Cleveland Cavaliers : Jabari Parker, SF/PF, Duke, Fr. In light of Joel Embiid’s injury, the Cleveland Cavaliers have a tough choice between Jabari Parker and Andrew Wiggins. Parker is the safer bet between the two prospects and also fills a position of need for the team. After striking out on Anthony Bennett last year, Cleveland cannot afford to whiff on the pick. Parker will not be as big of a bust as Wiggins has the potential to be, therefore in order to minimize the damage of a possible mistake, the Cavs will select the small forward from Duke number one overall. 2) Milwaukee Bucks: Dante Exum, PG/SG, Australia. Andrew Wiggins is too similar to Giannis Antetokounmpo to justify being drafted by the Bucks. Both players cannot consistently shoot the ball and use their elite athleticism and superb defensive skills to earn minutes. Exum, however, allows the team to shift Brandon Knight to his natural shooting guard position and helps the Bucks maintain good floor spacing. 3) Philadelphia 76ers: Andrew Wiggins, SG/SF, Kansas, Fr. The 76ers luck out with Wiggins falling to number three. The team has discussed moving up in the draft in order to secure their most desired player, however a deal with the Cavs will not be reached. Wiggins will team with Nerlens Noel and reigning Rookie of the Year Michael Carter-Williams to form a great foundation for the rebuilding Philly squad. 4) Orlando Magic: Joel Embiid, C, Kansas, Fr. It is hard to gauge Embiid’s draft stock after news broke – no pun intended – about the stress fracture in his foot. With two fractures over a five month time span, teams maybe too afraid to take a risk on the high upside Cameroonian from Lawrence. GM Rob Hennigan, who stems from the Spur’s front office tree, will be the one to pull the trigger on Embiid. Injury issues aside, he is the most talented big man prospect to come into the league since Dwight Howard. The Magic are historically good at developing big men – see Howard, Dwight and O’Neal, Shaquille – and the Magic are in need of a true franchise corner stone. Embiid could be the next Hakeem Olajuwon, and in this case, the reward far outweighs the risk of drafting him. 5)Utah Jazz: Noah Vonleh, PF, Indiana, Fr. Utah just missed out on Joel Embiid, but Vonleh is a great consolation prize. He is a stretch four with surprisingly good handles for a player of his size. Many people believe he could develop into the next Chris Bosh. With Derrick Favors and Enes Kanter underperforming, the talented Vonleh would be a great player to add to the Jazz frontcourt mix. 6) Boston Celtics: Marcus Smart, PG/SG, Oklahoma State, Soph. Marcus Smart is the logical draft choice for the rebuilding Celtics. He can play both guard positions and has the talent to be a franchise building block. He could fill in for Avery Bradley at the two guard if he leaves for free agency, or he could replace Rajon Rondo at the point if Danny Ainge decides to trade the former NBA Champion. 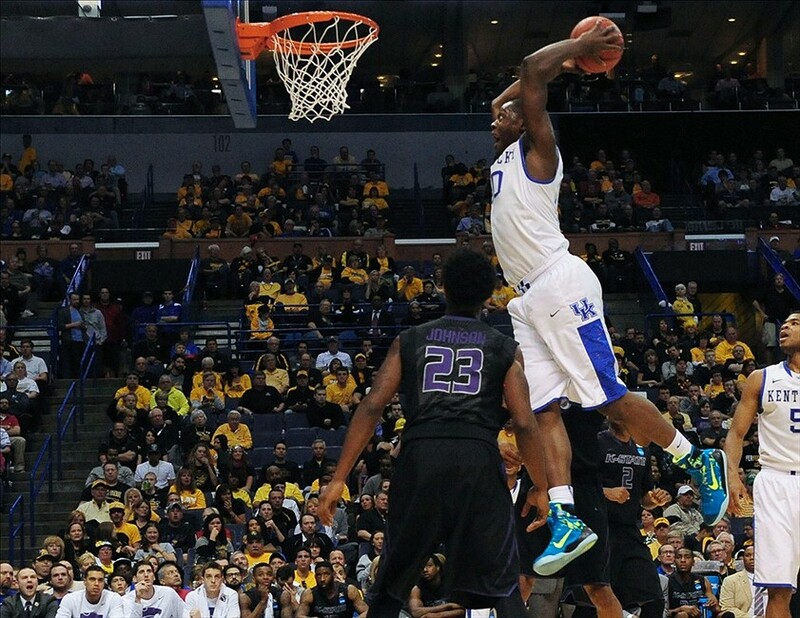 7) Los Angeles Lakers: Julius Randle, PF, Kentucky, Fr. Despite his foot injury, Randle is the very player L.A. needs in order to gain the talent needed to win now, with the youth to help win later. Randle is developed enough to create an immediate impact, while possessing just enough upside to help the Lakers in the future. He is also one of the best front court players available, which fills a need for the Lakers. 8) Sacramento Kings: Elfrid Payton, PG, Louisiana Lafayette, Jr. Mike Malone is a defensive minded coach looking for an upgrade at point guard. Payton is the best defensive point guard available. He also has a surprisingly high upside for a third year college player. Many believe that Payton is a jump-shot away from being one of the best players in this draft. With Isaiah Thomas testing free agency, the Louisiana Lafayette prospect is worth the gamble for a team in desperate need of a spark. 9) Charlotte Hornets: Doug McDermott, SF, Creighton, Sr. The Hornets are in dire need of shooting and “Dougie McBuckets” is at the top of the class. He can score in a variety of ways due to his high basketball I.Q., NBA offensive skill level, and general feel for the game. Couple McDermott’s offense with Michael Kidd-Gilchrist’s defensive capabilities, and the Hornets would form a formidable platoon at the small forward position. 10) Philadelphia 76ers: Aaron Gordon, SF/PF, Arizona, Fr. Gordon has the potential to be the next Shawn Marion or Andrei Kirilenko based on his defensive prowess, athleticism, and lack of a definitive position at the pro level. He lacks a true post game and the ability to hit a jump shot to stretch the defense. However, the 76ers are in such need of talent that they are one of the few organizations that can over-look these flaws to take a risk on Gordon. They could pair him with Nerlens Noel to form a dominant defensive frontcourt for years to come. 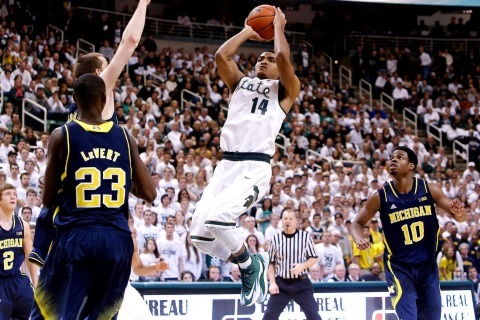 11) Denver Nuggets: Gary Harris, SG, Michigan State, Soph. The Nuggets need a shooting guard after ineffective seasons by Randy Foye and Evan Fournier. Both players are not above league average at the off-guard spot and the Nuggets need a dependable option in order to move forward. Harris has the skills needed to start right away, while possessing the upside to grow into a possible all-star player. 12) Orlando Magic: Zach LaVine PG/SG, UCLA, Fr. After taking Victor Oladipo last year, the Magic have shown they do not mind drafting a prospect who has more upside than skill. LaVine is definitely a player fitting that description. LaVine has shown the ball-handling ability and passing skill that make him a unique point guard prospect. However, he needs to become a better decision-maker in order to fully thrive at the point guard spot. With Orlando’s team seasons away from being competitive, Magic Coach Jacques Vaughn, a former NBA point guard, has time to allow the UCLA freshman phenom to learn on the job. 13) Minnesota Timberwolves: Nik Stauskas, SG, Michigan, Soph. The Timberwolves lack outside shooting help. Their most effective three point shooter was their power forward, which is never a good sign. Kevin Martin was not the solution to Minnesota’s shooting guard problem, but Nik Stauskas might be. What the Michigan product lacks in defensive ability and athleticism, he makes up for with skill and lights-out shooting. He will be able to stretch the floor and allow more driving lanes for Ricky Rubio. 14) Phoenix Suns: Jusuf Nurkic, C, Bosnia and Herzegovina. The Suns are looking for a big-bodied, rough and tumble center to balance out their roster. Alex Len proved to be more of a finesse power forward, while Miles Plumlee seems to be more of high energy off the bench. With players like Channing Frye and the Morris twins on the roster, Phoenix really lacks a true post player. Enter Nurkic, who reminds many GMs of Nikola Peckovic and Marcin Gortat. He would finally add a much need backbone in the post for the Suns. 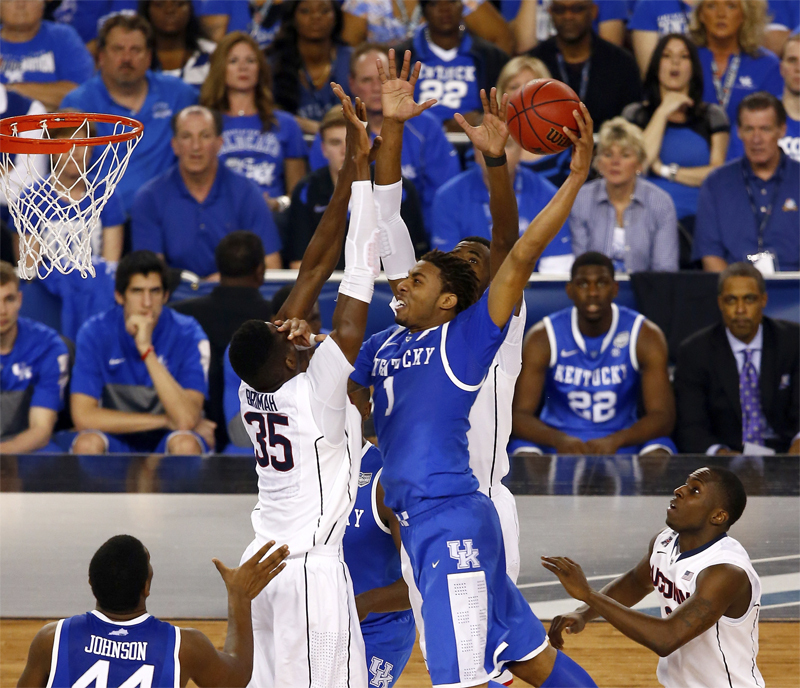 15) Atlanta Hawks: James Young, SG/SF, Kentucky, Fr. Mike Scott, John Jenkins, Jared Cunningham, Lou Williams, and Cartier Martin – this is the list of players who failed to take hold of the Hawk’s in flux wing position. Kyle Korver and DeMarre Carroll were the only players that played above-average basketball on the wing, but neither of them would be considered an NBA starting-caliber player. James Young would stabilize a position that has been lacking since Joe Johnson was traded to the Nets two years ago. Young could play the shooting guard with Korver and Carroll at the small forward position. 16) Chicago Bulls: Tyler Ennis, PG, Syracuse, Fr. Tom “The Point Guard Whisperer” Thibodeau may need to reload his backcourt with D.J. Augustin and Kirk Hinrich on the free agent market. Hinrich may be able to resign if he accepts a cap friendly deal, but Augustin may be too far out of the Bull’s price range to return. Drafting Ennis would help soften the blow. What the Syracuse point man lacks in athleticism, he makes up for with great passing and shooting skills, exceptional ball handling ability, and good leadership. He is no Marquis Teague, and is better equipped to handle what the Bulls ask for in a player than the former first-round pick. 17) Boston Celtics: Dario Saric, SF/PF, Croatia. With news that Saric signed a three year deal in Turkey, many teams will most likely pass on him for a prospect that could help right away. The Celtics are in a position where they can afford to take the “draft and stash” approach. It will take the Croatian two years before he can be bought out and play in the NBA. Boston has the liberty of waiting the two years to either bring Saric over or use him as trade-bait for a high impact player later on. 18) Phoenix Suns: T.J. Warren, SF/PF, North Carolina State, Soph. Warren may not have an NBA caliber jump shot, but the man can flat out score. If you have ever seen highlights of his 41-point performance over Pittsburgh, or the 42-performance over Boston College (both are worth the YouTube search), then you know how easy it is for him to score. With the plethora of stretch fours the Suns have on their roster, a player like Warren would offer a unique inside game to complement those players. 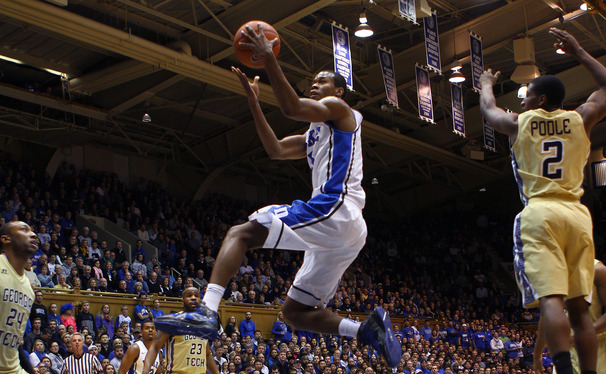 19) Chicago Bulls: Rodney Hood, SG/SF, Duke, Soph. The Bulls need to strengthen their scoring game. 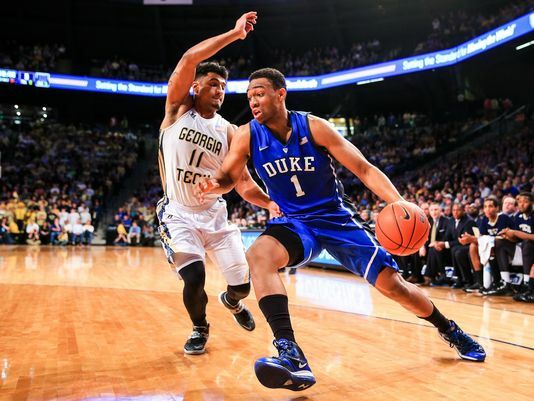 Rodney Hood was second in scoring at Duke last year behind Chicago-native Jabari Parker. Chicago also loves Duke prospects. The Bulls have had seven on their roster since the 1999-2000 season. If the shoe fits, wear it. 20) Toronto Raptors: Adreiane Payne, PF/C, Michigan State, Sr. Payne may have gone much higher if he were not 23 years old. At this point in time, Payne is a low ceiling, high floor prospect. He is a stretch forward with good athleticism and work ethic. Luckily for Payne, the Raptors need this type of player. Amir Johnson is the only power forward left on the roster, and he is more suited for a bench role. Payne can start immediately for a team fresh off of its first playoff birth since 2008. 21) Oklahoma City Thunder: Clint Capela, PF/C, Switzerland. Capela is a very young, athletic center prospect without much basketball skill. He is very raw as a player, but after taking Steven Adams last year in the draft, Thunder GM Sam Presti has shown a willingness to draft high upside players. Capela would serve as a back up to Serge Ibaka, while developing into the defensive force the team needs him to be. 22) Memphis Grizzlies: PJ Hairston, SG, Texas Legends (D-League). The Grizzles lack a scoring threat, and Hairston is one of the best scorers in this year’s draft class. He can provide Memphis with back court scoring it has missed since O.J. Mayo left in free agency two years ago. 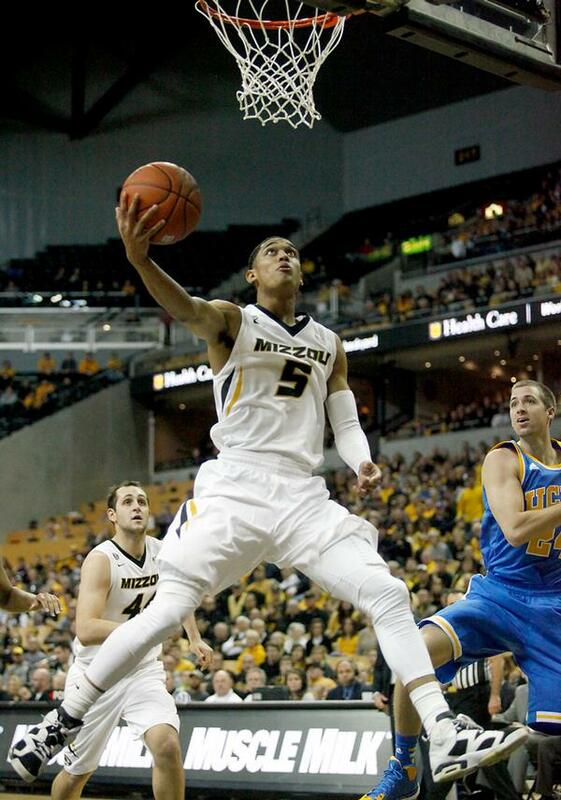 23) Utah Jazz: Jordan Clarkson, PG/SG, Missouri, Jr. Clarkson has been a fast riser in recent weeks. He has shown an improved shooting stroke and the versatility to play both guard spots. The Jazz need a bigger guard to help the smaller Trey Burke thrive. Clarkson’s addition would also allow Utah to bring Alec Burks off the bench, a role he is better suited for. 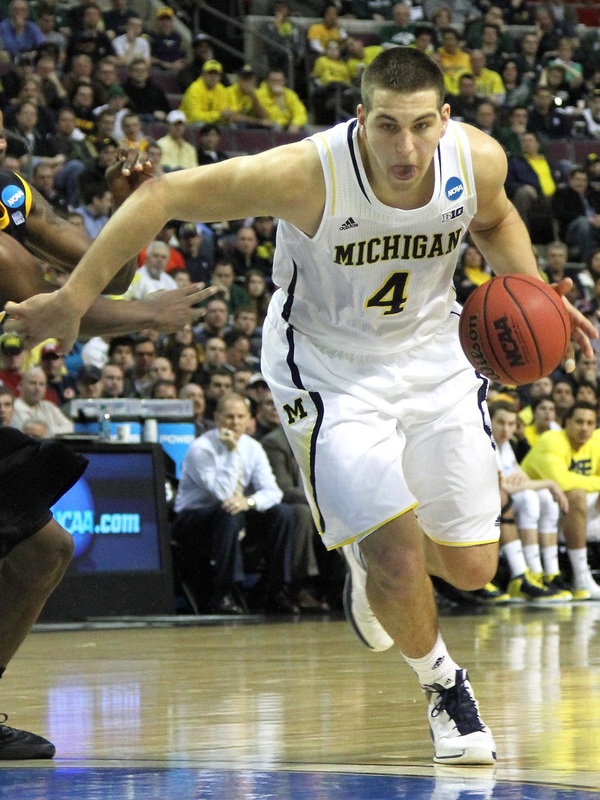 24) Charlotte Hornets: Mitch McGary, PF/C, Michigan, Soph. According to Chad Forde’s Twitter account, the Hornets have issued McGary a promise that if he is available at the twenty-fourth pick, the team will select him. The former Michigan center would be an odd choice for a team that recently added Cody Zeller, but McGary is 6’10, and it is hard to find quality production in the post. 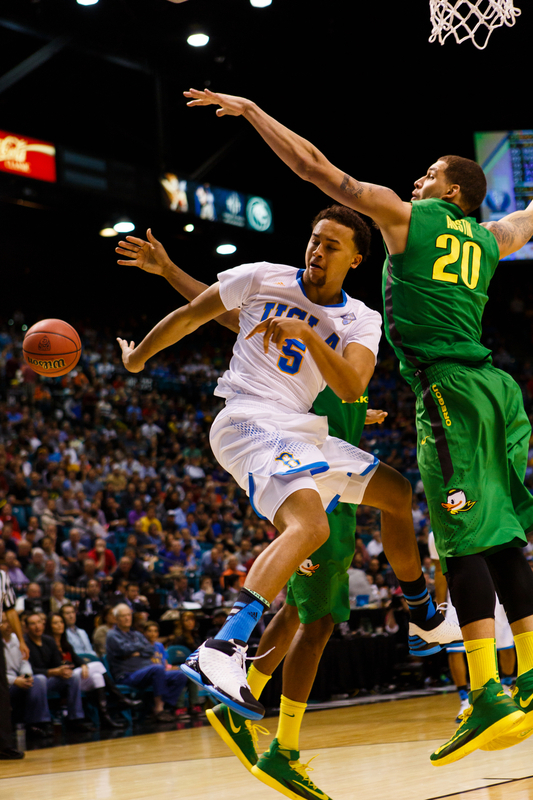 25) Houston Rockets: Kyle Anderson, PG/SF, UCLA, Soph. Darryl Morey, more commonly known as “Dork Elvis,” loves accruing assets more than he likes drafting players. A 6’9” point guard is very hard to come by. If Anderson shows that he could play at a NBA pace, he could be quite the trade chip for Morey down the road. 26) Miami Heat: Shabazz Napier, PG, UConn, Sr. Miami wants to “retool” instead of “rebuild,” therefore the team feels that four year players are a better investment than high upside prospects. No one has a more decorated career than Napier. The two time national champion will be a welcomed addition to a team desperate for an efficient, do-it-all point guard. 27) Phoenix Suns: K.J. McDaniels, SG/SF, Clemson, Jr. With P.J. Tucker a free agent, the Suns need a cheap replacement for a classic “Three and D” guy. McDaniels offers great perimeter defense with a solid outside jump shot. Younger and cheaper always sounds good to a team with an all-star restricted free agent, Eric Bledsoe, on the books. 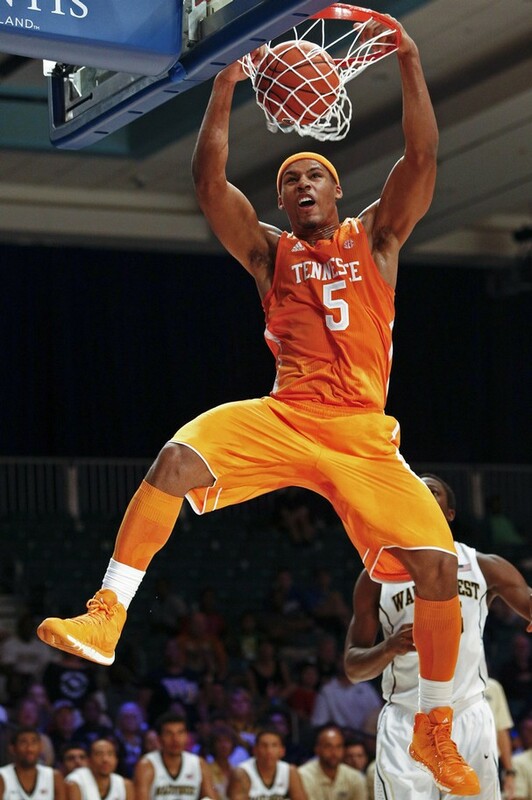 28) Los Angeles Clippers: Jarnell Stokes, PF, Tennessee, Jr. Stokes is a banger in the post with tremendous amounts of strength and not much athleticism. The Clippers have plenty of the latter but not much of the former. 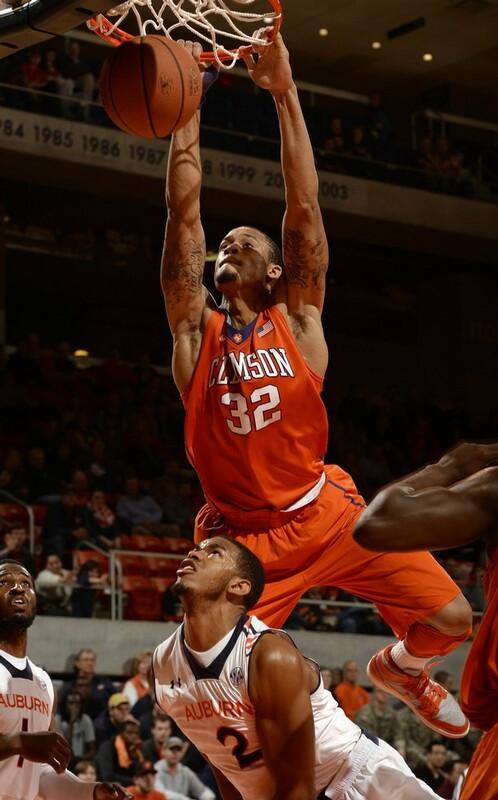 Stokes offers them toughness in the paint, which they have not had in a long time. He will also be a welcomed upgrade over Glenn Davis. 29) Oklahoma City Thunder: Spencer Dinwiddie, PG/SG, Colorado, Jr. Had it not been for an ACL tear last season, Dinwiddie would be much higher on this list. He is a big bodied guard with the ability to play the one and the two. He is a player who is capable of running an NBA offense while keeping his turnover rate low. He would serve as a great backcourt partner to Reggie Jackson. 30) San Antonio Spurs: Bogdan Bogdanovic, PG/SG, Serbia. Bogdan averaged 31 points this past week in the Serbian League finals for KK Partizan. If Patty Mills decides to walk in free agency, the Spurs have found their new gunner for the bench. If Mills returns, the Spurs can stash Bogdanovic overseas for one or two more seasons. By doing so he can develop into Manu Ginobili’s heir apparent and eventual replacement. The draft is only a week away and a lot of moving and shaking has taken place over the last few days. Surprise prospects have been climbing up many GM’s draft boards. Trade rumors are springing up left and right adding more intrigue to an already unpredictable draft. Here are my picks for my new NBA mock draft. With the first match of the World Cup only nine days away, the anxieties and expectations that have built up for the past four years are about to fade away as play begins. There are plenty of questions that help shape the predicted outcome of this year’s tournament. 1) Can a non-South American team win the cup this year? South American teams are 6-0 when the tournament has been hosted on their home continent. Argentina, Brazil and Uruguay account for all six of those victories with each nation having two wins apiece. With Brazil (tenth) and Uruguay (sixth) ranked outside of the top five in the world, and Argentina ranked third behind Spain and Germany; none of the aforementioned countries are invincible. Germany, Spain, and Portugal will all make a push to be the first European team to win across the Atlantic. 2) Can Spain repeat as champions? Spain won the previous World Cup in South Africa back in 2010. They are also repeat champions of the European Cup, winning the tournament in 2008 and 2012. This makes the Spanish squad the only soccer club to win three consecutive major tournaments. Many believe that the country’s dynasty will end this year. However, this team is ranked number one in the world, and has only gotten better since 2012 by adding players like Diego Costa, Koke, and Cesar Azpilicueta. It will take a lot to beat the improved Spanish club. 3) Will Brazil feel the pressure or rise to the occasion?The last time Brazil hosted the World Cup in 1950, Uruguay won the tournament. 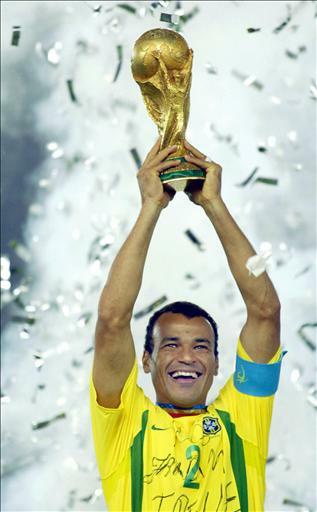 The last time Brazil won the tournament was 2002. The Brazilian fans are hungry not only for the cup, but to win it in their own backyard. If the team were to win, that would make them only the seventh host country to win the cup and the first since France in 1998. 1) The climate: Brazil is a country with a wide variety of climates due to its large size. The average temperature of the country is about 25° Celsius, which is 77° Fahrenheit; however, it could be almost 50° Celsius, or twice as warm, in certain areas. 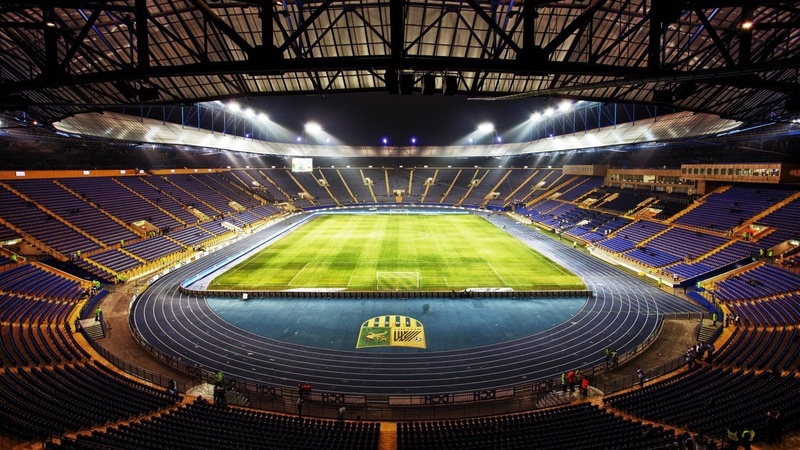 Most of the European teams have not had to play in those conditions; this gives an advantage the South American teams, particularly specifically Brazil. 2) Brazil’s defense: Brazil has one of the most impressive defensive backfields in the tournament. Dani Alves, Thiago Silva, Marcelo and David Luiz are pegged to start for the Green and Yellow. The squad also has the likes of Dante, Maicon, Henrique, and Maxwell available as substitutes. A deep and experienced backfield will give Brazil the edge during such a long and physically taxing competition. 3) Argentina’s forwards: The Argentinean team has a talented group of forwards that serve as the driving force of the squad. Lionel Messi, Gonzalo Higuain, Sergio Aguero, and Ezequiel Lavezzi are all capable of scoring anywhere from the field. 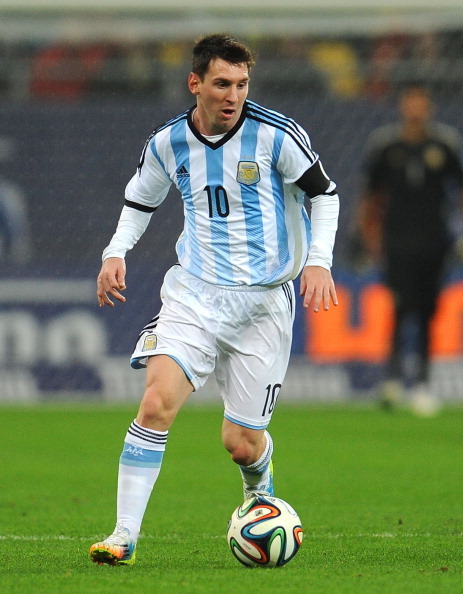 Messi is especially key to the Argentine attack. He is one of the top players in the world, along with Crisitano Ronaldo, and capable of taking over a whole match single-handedly. Messi must play up to his capabilities in order for the team to thrive. Based on the talent present on both squads and the added value of the “home-field” advantage of South America, I believe that Argentina and Brazil will meet in the finals this year and one of these two teams will walk away with the FIFA World Cup Trophy. …But What About the United States? I believe that the United States has the potential to make it out of group stages and into the semifinals. 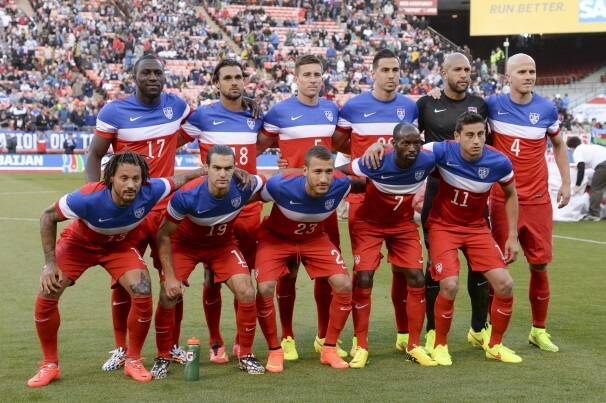 However, the US must beat Ghana, and they must do it by a wide margin. Germany is the favorite to come out of Group G, but Portugal, who is favored to finish second in the group, could struggle if Cristiano Ronaldo is the only player to perform during group stages. If the US were to tie Portugal during their match and only narrowly lose to the Germans, then a large goal differential could advance them to the quarterfinals. It is a tough feat, but this squad has a great mixture of athleticism, youth, and skill. This combination of players has the possibility to run the table and surprise many teams this year in Brazil.